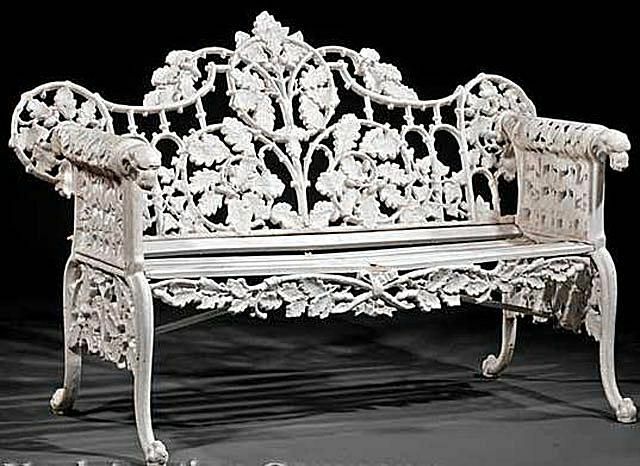 Coalbrookdale Cast Iron Garden Bench, c. 1860-1900. Like so many other objects that could have been seen as ordinary before, outdoor furniture became opulent in the 19th century. The Victorians loved their gardens, and they also loved to decorate them with all the unmistakable zeal they applied to their homes. They adorned spaces with urns, statues, gazebos—and, of course, chairs, benches, settees, and tables. One of the leading purveyors of outdoor furniture at the time was the Coalbrookdale Company of Shropshire, England. Coalbrookdale furniture was designed in a variety of styles, paralleling that of interior furniture popular at the time including Gothic Revival, Renaissance Revival, and Rococo styles. Ornate and often lavishly detailed—fruit and floral motifs were especially popular—pieces were usually painted a bright color or white. The artful openwork gave them a light air, for all their opulence and the weight of their material. Settees, one of the firm's most iconic items, often had wooden-slat seats that were usually made of pine. Oak was available for an additional price, according to Debbie Tice, owner of Webberley Antiques in Wadhurst, East Sussex, England. Coalbrookdale also made interior furniture and decorative objects, but the firm is decidedly best known for its garden furnishings. Those remain the most prized by collectors. A single piece of garden furniture, whether a settee or a table, generally sells in the thousands today through high-end dealers or at auction. Pieces made during the 19th century usually are stamped "Coalbrookdale" or "C-B Dale Co." They also bear a kite mark (a diamond-shaped patent-registration stamp common to English furniture, before the advent of serial numbers), and a six-digit pattern or model number. Those beginning with "1" indicated a date between 1842 and 1867; those with starting with a "2" are 1868 and later. As mentioned above, those who designed for Coalbrookdale did not sign their pieces. Some characteristics of their work, like that of Christopher Dresser, are recognizable by looking at elements in the designs. Founded in 1709, the family-owned company was famed for its cast iron works. Using improved methods, they first made sand-cast iron pots, and also produced parts for steam engines. Their work includes fabricating the famed Iron Bridge in the company's home town (the first ever made entirely of cast iron) in 1780 as well, which earned the business accolades at the time. In the 1840s, the company's president Francis Darby began developing lines of decorative furniture. Given its strength and resistance to rust, cast iron was ideal for pieces intended for outdoor use. If cared for properly, cast iron could last forever. And since it could be mass-manufactured, it was more economical than wrought iron. This made it perfect for the rising middle-class clientele. That doesn't mean it was of low quality. Coalbrookdale's cast iron furniture is viewed as some of the finest and most intricate ever made. In fact, the furniture scored a hit at London's Great Exhibition in 1851, and Queen Victoria herself became a client of this popular company. Christopher Dresser, who is seen by many as a pioneer in the Arts and Crafts movement in England, designed for Coalbrookdale beginning in 1867. While he worked as a designer for companies that made a variety of goods (ceramics makers Minton and Wedgwood to name two), his tables, chairs, benches, stoves, and hat racks manufactured by Coalbrookdale stand out. Some antique enthusiasts find these pieces to be his best work, in fact. "Look for scrolled geometric plants and flowers interspersed with incised lines and zigzags," according to Christopher Proudlove, a British writer specializing in antiques. "Problem is, his pieces were never signed, but his style is unmistakable." By 1929, the Coalbrookdale Company had merged with several others, ceasing its independent existence as a family owned business. Even so, designs with Coalbrookdale roots dating back more a century are still being produced today to the delight of those who own them.